Cranberry is an evergreen berry shrub native to North America. This berry plant is used for treating bladder and kidney disease, yeast infection and helicobacter pylori infections resulting in gastrointestinal ulcers and dental plagues. An allergic reaction to cranberry is rare but possible. If you experience a severe allergic reaction, and experience difficulty breathing, heart palpitation, light headedness and low blood pressure, seek immediate medical attention. Cranberries are an excellent source of vitamin C and antioxidants. 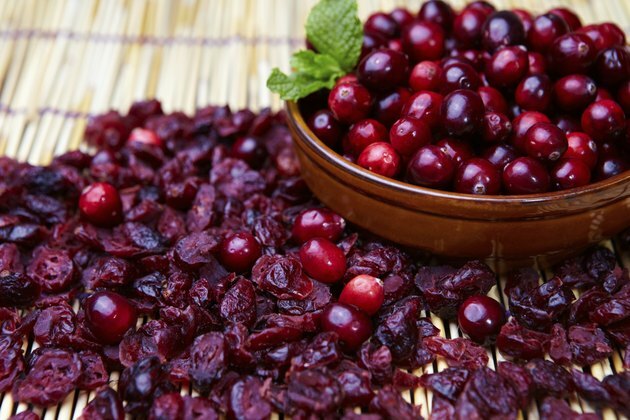 Cranberry is used to treat urinary tract infections of the urethra and bladder in women. The acidic content in cranberry inhibits E. coli colonization in the urinary tract, and bladder. It also used to prevent bacterial infection from Helicobacter pylori, which can result in stomach ulcers. The antioxidants in cranberry prevent the damaging effects of free radicals on the cells and tissue of your body. The antioxidants in cranberry prevent DNA damage, and lipid oxidation in the bloodstream which results in the formation of atherosclerotic plaques. Regular consumption of cranberries prevents diabetes, cardiovascular disease, neurodegenerative diseases such as Alzheimer's disease, and tumor development and growth. Although an allergic reaction to cranberries is rare, it is possible. An allergic reaction can occur in response to proteins formed from DNA fragments homologous to Mal d 1 and Mal d 3, which are allergens present in apples. The immune system recognizes these proteins as foreign, and mounts an IgE mediated response in which the immune system begins producing IgE plasma cells. These antibody-producing cells increase the immune response by activating and binding to pro-inflammatory immune cells known as mast cells. The immune response encourages the release of histamines and other immune mediators to the bloodstream. The release of histamine into the bloodstream results in vasodilation and increased permeability of blood capillaries. Fluids and toxins leak to the surface of the skin resulting in swelling, redness and inflammation. Itchy, hives involves with a skin rash is a common symptom of an allergic immune response. The hives typically appear within 24 hours of ingesting cranberries, and can appear anywhere on the body. The hives are red, itchy and elevated with a pale center, and may migrate throughout the body. The hives are typically accompanied with eczema, a skin inflammation that typically appears on the knees, elbows, neck and face. The rash due to eczema is also elevated, red and extremely itchy. They may also leak fluids that eventually crust over, making the skin leathery and cracked as a result of the itching and scratching. The best treatment for a cranberry allergy is strict avoidance of cranberry in any form. You might also be allergic to other members of the Vaccinium species, thus you should also avoid blueberries, buckberries, and bilberry. Always read the ingredient list and labels on all foods and drinks to ensure it does not contain cranberries. If you do experience an allergic skin rash, antihistamines and over the counter corticosteroids such as can help alleviate the itching, inflammation and discomfort.